Best Solution for Adding Solar Power to your RV — Sun Power RV - Go Power solar panels, inverter kits, battery sales and installation for RV, motorhome, and yacht. One of the simplest and most cost effective ways to add solar power to your RV motorhome is with a PORTABLE solar panel kit. These folding panels come with a carrying case and can be placed in the sun while your rig is parked in the shade. 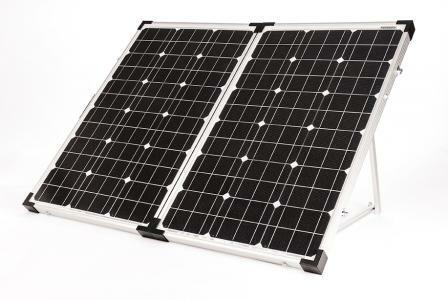 Two sizes, an 80 watt and a 120 watt Portable solar panel kit, are available. It is easy to connect the battery leads to your existing coach batteries and the included quick connect makes it very fast to add solar power when the sun is out.